The Franklite Atrio 4 Light Lantern is a traditionally styled interior lantern in a Chrome finish. The Elstead Cambridge Solid Brass Flush Interior Ceiling Lantern is in a Burnished Brass finish with clear optic glass. The Elstead Cambridge Solid Brass Large Interior Ceiling Lantern is in a Burnished Brass finish with clear optic glass. The Elstead Cambridge Solid Brass Small Interior Ceiling Lantern is in a Burnished Brass finish with clear optic glass. The Oaks Corfe 4 Light Lantern Style Ceiling Light Pendant is in a Silver Brushed Black finish with storm glass shades. The Elstead Dakota Interior Lantern Ceiling Light Pendant is in a Polished Antique Nickel finish with clear seedy glass. The Deborah Oval Interior Lantern is in an Antique Brass finish. The Deborah Oval Interior Lantern is in a Nickel finish. The Deborah Round Interior Lantern is in an Antique Brass finish. The Deborah Round Interior Lantern is in a Nickel finish. The Elstead Declaration 4 Light Interior Ceiling Lantern is in an Antique Forged Iron finish with clear seeded glass shades. The Elstead Hobson Single Light Interior Lantern is in an Antique Forged Iron finish with a Seeded glass shade. The Elstead DeWitt Interior Lantern is in a gilded Sunrise Silver finish with a matching teardrop crystal. The Dome Flush Ceiling Light is in a Nickel finish with filigree banding and a decorative finial. The Kansa Dome Uplighter Rod Ceiling Pendant is a traditional prismatic ceiling light inspired by the 1920s and 30s. The Franklite Domed Glass Large Ceiling Light has a Brass trim and a ribbed acid glass shade. The Franklite Domed Glass Large Ceiling Light has a Bronze trim and a ribbed acid glass shade. The Franklite Domed Glass Large Ceiling Light has a Satin Nickel trim and a ribbed acid glass shade. The Franklite Domed Glass Small Ceiling Light has a Brass trim and a ribbed acid glass shade. The Franklite Domed Glass Small Ceiling Light has a Bonze trim and a ribbed acid glass shade. The Franklite Domed Glass Small Ceiling Light has a Satin Nickel trim and a ribbed acid glass shade. The Oaks Drop Suspension Flush Ceiling Light Is In An Antique Brass Finish With A Small Frosted Shade. 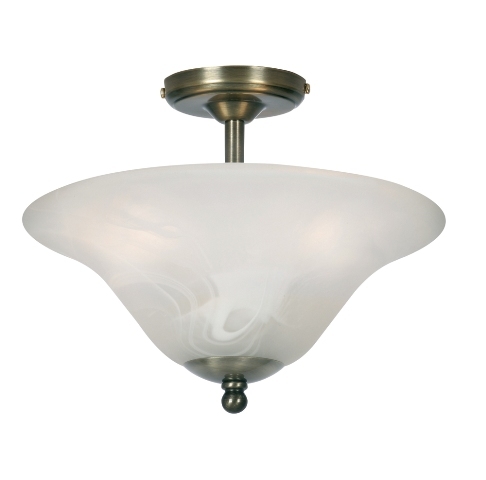 The Oaks Drop Suspension Flush Ceiling Light Is In A Matt Nickel Finish With A Small Champagne Shade. The Oaks Drop Suspension Flush Ceiling Light Is In A Polished Brass Finish With A Small Frosted Shade. The Oaks Drop Suspension Flush Ceiling Light Is In A Polished Brass Finish With A Small Champagne Shade. The Oaks Dulverton Interior Lantern is in an Antique Brass finish with clear glass panels. The Oaks Dulverton Interior Lantern is in an Antique Chrome finish with clear glass panels. The Oaks Dulverton Interior Lantern is in a Polished Brass finish with clear glass panels. The Elstead Dunhill Semi-Flush Ceiling Light is in a Royal Bronze finish with a faux alabaster glass shade. The Oaks Fern 1 Light Lantern is in an Antique Brass finish with clear glass panels. The Oaks Fern 2 Light Interior Lantern is an Antique Brass finish with clear glass panels. The Oaks Fern 4 Light Lantern is in an Antique Brass finish with clear glass panels. The Oaks Fern Flush Lantern is in an Antique Brass finish with clear glass panels. The Oaks Fern Single Interior Lantern is in an Antique Chrome finish with clear glass panels. The Oaks Fern 2 Light Interior Lantern is in an Antique Chrome finish with clear glass panels. The Oaks Fern 4 Light Interior Lantern is in an Antique Chrome finish with clear glass panels. The Oaks Fern Flush Interior Lantern is in an Antique Chrome finish with clear glass panels. The Oaks Fern Flush Lantern range is in a cream gold finish with clear glass. Stock sale. The Oaks Fern 351/2 AB TIFF is in an antique brass finish with tiffany effect glass. Stock sale. The Elstead Finsbury Park Small Interior Lantern is a traditional handmade ceiling light in an Old Bronze finish with clear pumpkin glass. The Elstead Finsbury Park Medium Interior Lantern is a traditional handmade ceiling light in a Polished Mickel finish with clear pumpkin glass. The Elstead Finsbury Park Small Interior Lantern is a traditional handmade ceiling light in a Polished Mickel finish with clear pumpkin glass. The Elstead Fort Quinn 4 Light Ceiling Lantern is in a Marcado Black finish and an historic design. The Elstead Fort Quinn 8 Light Ceiling Lantern is in a Marcado Black finish and an historic design. The Elstead Gentry Flush Interior Ceiling Lantern is in a Polished Solid Brass finish with clear bent glass panels. The Elstead Gentry Large Interior Ceiling Lantern is in a Polished Solid Brass finish with clear bent glass panels. The Elstead Gentry Medium Interior Ceiling Lantern is in a Polished Solid Brass finish with clear bent glass panels. The Elstead Gentry Small Interior Ceiling Lantern is in a Polished Solid Brass finish with clear bent glass panels. The Elstead Gentry Flush Interior Ceiling Lantern is in an Olde Bronze finish with clear seedy bent glass panels. The Elstead Gentry Large Interior Ceiling Lantern is in an Olde Bronze finish with clear seedy bent glass panels. The Elstead Gentry Medium Interior Ceiling Lantern is in an Olde Bronze finish with clear seedy bent glass panels. The Elstead Gentry Small Interior Ceiling Lantern is in an Olde Bronze finish with clear seedy bent glass panels. The Elstead Gentry Flush Interior Ceiling Lantern is in a Pewter finish with clear bent glass panels. The Elstead Gentry Large Interior Ceiling Lantern is in a Pewter finish with clear bent glass panels. The Elstead Gentry Medium Interior Ceiling Lantern is in a Pewter finish with clear bent glass panels. The Elstead Gentry Small Interior Ceiling Lantern is in a Pewter finish with clear bent glass panels. The Kansa Georgian Large Lantern in Chrome is a substantial, traditional mouth blown glass interior lantern with chrome finish metalwork. The Kansa Georgian Medium Lantern is a traditional mouth blown glass interior lantern with Chrome finish metalwork. The Kansa Small Georgian Fern Chrome Lantern is a traditional mouth blown hand-cut glass interior lantern with Chrome finish metalwork. The Elstead Guildhall Interior Lantern is in an Antique Dark Bronze finish and a Georgian design. The Elstead Guildhall Interior Lantern is in a Polished Nickel finish and a Georgian design. The Elstead Harrow Flush Ceiling Light is in a Polished Nickel finish with clear seeded glass. The Firstlight Imperial Large Interior Lantern is in an Antique Brass finish. The Firstlight Imperial Large Interior Lantern is in a Chrome finish. The Firstlight Imperial Small Interior Lantern is in an Antique Brass finish. The Firstlight Imperial Small Interior Lantern is in a Chrome finish. The Elstead Larkin 3 Light Interior Ceiling Pendant is in an Olde Bronze finish with a strong, linear silhouette. The Elstead Larkin 3 Light Interior Ceiling Pendant is in a Brushed Nickel finish with a strong, linear silhouette. The Elstead Larkin Interior Ceiling Pendant is in an Olde Bronze finish with a strong, linear silhouette. The Elstead Larkin Interior Ceiling Pendant is in a Brushed Nickel finish with a strong, linear silhouette. The Elstead Luminary 3 Light Interior Lantern is in an Oil Rubbed Bronze finish. The Elstead Luminary 4 Light Interior Lantern is in an Oil Rubbed Bronze finish. Luxury Lighting supply a selection of modern, contemporary and traditional interior ceiling lanterns and hallway lights. These ceiling lanterns will grace a modern hallway or a grand stately home entrance in style. Weather you are looking for flush ceiling lanterns or hanging lanterns we are sure we have the perfect one for you.